The close of the year generally sees a concentration of holidays that translate into big family gatherings, sales events, and religious platitudes of piety and thankfulness. Halloween, Thanksgiving, Hannukah, and Christmas take up the lion's share of attention, but almost lost in the shuffle is Veteran's Day. This holiday was set up in appreciation of our men and women in uniform, and distinguishes itself from the earlier Memorial Day which honors those who have died in battle. It's not hard to figure out why Veteran's Day is often overlooked; there's nothing involved in the holiday which spurs consumers out to buy food, costumes, or gifts, and so stores usually ignore it, moving straight from Halloween candy sales to discounts on turkey and stuffing. When one considers that the United States has been at war for 13 consecutive years, however, the importance of those soldiers who have risked (and sometimes lost) their lives to protect our nation cannot and should not be sidestepped. You don't have to be a dogmatic flag-waving patriot, in order to appreciate the people in uniform whose stamina and courage is undoubted; or maybe you are a flag-waving patriot. In either case, 4seating offers up this shortlist of soldier or military-themed films for your perusal on Veteran's Day. In compiling this list, we avoided films with an anti-war theme (ie. Apocalpyse Now, Platoon), although many of those are classics worth considering as well. 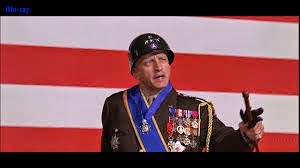 George C. Scott's portrayal of General George S. Patton, a heroic commander who fought several key WWII battles, is considered one of the finest performances in film history. The opening monologue, with Scott as Patton standing proudly behind the American flag, is iconic, but Patton is much more than that. The battle sequences were state-of-the-art for their time and while film technique has moved on since then (see the films below), Scott's performance has not aged a day. Patton also just happened to be Richard Nixon's favorite film, but don't let that stop you from marveling at this gritty and epic tribute to the men who fought and won the greatest conflict the world has ever known. Steven Spielberg was still primarily known as a director of sci-fi/fantasy oriented summer blockbusters when he decided to take the reigns for this WWII drama. 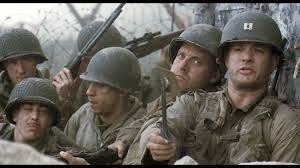 Sure, there had been 1993's Schindler's List, for which he had won the Oscar, but it was Saving Private Ryan (which won him a second Oscar) that married Spielberg's penchant for gripping action fare with an equally compelling story. The first 27 minutes of this film are often hailed as the most intense and realistic depiction of war ever shot, and Hanks' performance in the lead was similarly praised. Spielberg would go on to make further critically-acclaimed films, but this one stands as perhaps his best, and is perfect Veteran's Day fare. Goldie Hawn's career was in high gear when she decided to co-produce this starring vehicle for herself, which went on to earn several Academy Award nominations and be included in many "all-time greatest" comedy film lists. 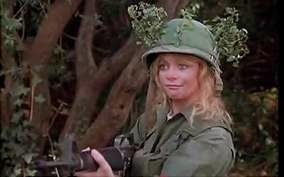 The Private Benjamin of the title braves army boot camp, later romances a French doctor, and then ultimately leaves him when she finds out he's cheated. Her stint as a soldier gives her the courage to strike out on her own; the film simultaneously works as tribute to the life of a soldier, as a feminist salvo, and as a deft mix of comedy and drama. 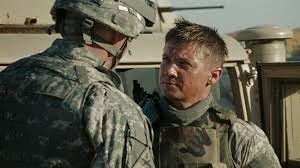 Known primarily as the film which garnered the first-ever Oscar for a female director (Kathryn Bigelow), The Hurt Locker is a tough, gripping character study that exposes the horrors of modern-day warfare. Although its portrayal of a bomb disposal unit in Iraq met with claims of inaccuracy from those who were actually in the field, its main character Sgt.James is complex and multi-dimensional, torn between an obsession with his work and the needs of the outside world. The film combines spine-tingling suspense with a look at the dangers faced on a minute-by-minute basis by combat soldiers in Iraq, without being preachy or taking sides. Quentin Tarantino was never going to make an ordinary war epic, and Inglourious Basterds was unique in that it posited an alternate history of WWII with a completely different ending than the one we learn from history books. The film is loaded with Tarantino's trademark dialogue and quirky sense of humor, although it is perhaps Christoph Waltz's breakout performance as Hans Landa which truly set it apart. Waltz's "Jew hunter" Landa was lauded as one of the most memorable film villains in years, and won him a supporting actor Oscar for the role. 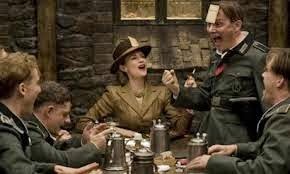 Inglourious Basterds may not be the most reverent war movie ever made, but it is one of the most fun.